Many beams have a step on the inside edge for use with support structures. Typically designed to drive in with a lift truck, this type of rack has rails often made of steel angle iron running perpendicular to the aisle. The pallet sits on the rail and the span being bridged is the distance between the rails. Edge rack drive-in systems usually have a common entry and exit point for each aisle. These are racks designed with rollers positioned at the pallet’s contact points. These can look just like an edge rack but instead of simple angle iron, the rails are replaced by rollers. The span in this case would be similar to the edge rack. Rollers allow pallets to easily slide into position. This type of racking system employs an intrinsic platform that is loaded and then pushed back perpendicular to the aisle. The most efficient systems have platforms that deploy from on top of one another, exposing the next platform as the top one is pushed back. In this case the design of the platform would determine the span that would need to be bridged. Storage density is increased when using a push-back rack. These racks are designed to allow pallets to be loaded in one side of the rack and flow through the rack, usually by gravity, to be removed from the other side. Often designed with 3 sets of rollers perpendicular to the aisle, the roller sets would be on a slight downward angle from entry to exit allowing gravity to move the pallet through the rack. Sometimes there are "brake wheels" installed mid-way on the racks to slow pallets down on their way to the other side. In most cases, there would be a center set of rollers making for a short span. Flow racks may also be referred to as gravity flow racks. This rack has uprights parallel to the aisle with support beams cantilevered out from the uprights, perpendicular to the aisle. These racks are most often used for long items that would not fit into a conventional rack with uprights in the way every 8 feet or so. Pallets used in these racks are almost always custom designed to the specific product they are meant to carry. Cantilever racks almost always require custom-made rackable pallets. ​This is usually a beam rack with some kind of support structure that helps with the span from front to back. This could be a series of spanning bars fit perpendicular to the beams front to back, or my personal favorite, the wire deck. In this case a section of heavy gauge wire mesh is placed on the beams, often with extra support members to hold whatever is placed in the rack. 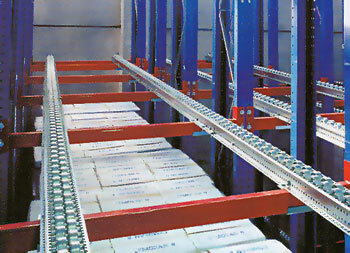 A supported rack opens up options for rackable pallet choices because there is no span! You now know the seven most common types of racks used with rackable pallets. I avoided the panoply of custom solutions, sophisticated AS/RS, stacker-crane systems and the like as each really needs to be evaluated on its own. If you still have questions about pallet racks, please feel free to ask them here. Watch for my next post which will go into detail about how pallets interact with racks. Yes, Virginia, thus making them rackable! Use of racking system photos 1-2 and 4-8 used with permission from our friends at Warehouse Rack & Shelf, LLC. Use of photo 3 Pallet Flow by Markj52 licensed under the Creative Commons Attribution 3.0 Unported license.